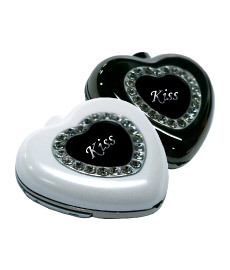 Zakang's Kiss, A Heart Shaped MP3 Player | OhGizmo! Okay, I know that Valentine’s Day is long gone but you can always try to impress your better half with the new heart-shaped Kiss MP3 Player, from Korean company Zakang. This little player is encrusted with 23 SWAROVSKI crystals (mmm, wonder if they come out!). So am I missing something? Oh yeah it has a storage capacity ranging from 128MB to 1GB and data transfer takes place via USB. You can check out the product page for more details and brush up your Korean when you are at it.